I first heard of the Depression and Bipolar Support Alliance from a friend soon after I was diagnosed with bipolar disorder. She took me to my first meeting and became my regular carpool each week. The first time I had no idea what to expect and I was a bit scared. There was a part of me that didn’t want to go because it felt like I was admitting defeat once and for all – that’s right, I’m off to a bipolar meeting so, yep, I admit it. I have bipolar. What I was getting into? Was this group therapy? Was it a 12 step program? Would we all get naked and share our vulnerabilities? The meeting was in a large room with the stereotypical circle of chairs in the center. There were about 15 – 20 people. Each person spoke, if they desired, and with each one I was stunned to hear my words from their mouths. I kept looking towards the obvious leader expecting her to dole out some useful psychiatric advice on how each individual should handle their particular situation, but it never happened. I learned later that the leader of the group was not a psychiatrist, not a psychologist, not a doctor of any kind. In fact, the leader each week was chosen at random. This was not group therapy. These were just regular people. Well, regular people with a mood disorder. This was just a group of peers supporting each other and sharing their own experiences. After a person shares what they have to say, they can tell the group whether they would like feedback or not. Some people just want to get their feelings out without having someone try and “fix” them. What is the Depression and Bipolar Support Alliance? According to their website, the Depression and Bipolar Support Alliance (DBSA) is the largest peer directed organization which focuses on depression and bipolar disorder. They have over 700 support groups throughout the U.S. I do not exaggerate when I say that DBSA saves lives. When you meet with a group of people week after week you can’t help but learn each individual’s personalities. Some of the worst cases of depression I have seen were in meetings and I’ve seen those individuals convinced to go to the emergency room because they were on the edge. It was far too dangerous for them to go home alone. The meeting I attended was far from me, so when my friend could no longer give me rides I felt devastated. I have so much love for the program that I decided to start a group near me. DBSA made the process easy. They provided excellent information to help get me started and a large amount of other materials, such as pamphlets and fliers. They even provided a web page to promote your group. Unfortunately I was unable to secure a good location. All hospital meeting rooms, church halls and library meeting rooms that I contacted were taken. The only location I was able to get was very nice, but far too remote. There were complaints from attendees that the meeting space was too far, so, I was unable to build a group large enough to continue. That was a few years ago and I’m still itching to return to meetings. I’m considering trying again to make calls to see if I can find a meeting space that is more centrally located. If you are diagnosed with depression or bipolar disorder, I highly recommend seeking out and attending a DBSA meeting. 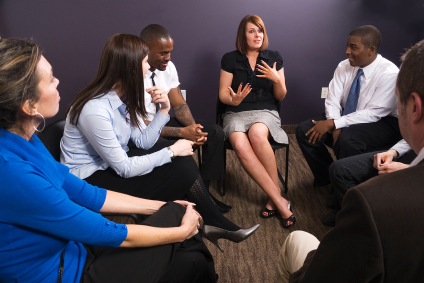 You can find meeting locations on the Depression and Bipolar Support Alliance website. Even if you think you’re not interested, give it a try for a couple of meetings and you may change your mind. I think you’ll be glad you did. Thank you. I just located a local chapter and sent an email. I am interested to see what happens. I once went to a meeting of High Flyers and Low Landers, but found it was not for me. Perhaps this will be better suited to my needs. I’m glad you sent the message. I’ve never heard of High Flyers and Low Landers. I hope DBSA works for you. You never can tell since different groups have different personalities. We have some around LA that I would never go to, and some that I think are wonderful. Sadly, they’re all too far for me to get too.